Not a lot of shooter series out there can brag about having a level of confidence that matches the Earth Defense Force series. It is totally comfortable in knowing exactly where it stands in the world, and what it lacks in depth and flashy graphics, it more than makes up for with delivering the same schlocky fun its fans crave. You won't see this development team caving into trends any time soon. The latest gameplay trailer from the upcoming Earth Defense Force 2025 is proof enough of that. One again, gamers take the role of a grounded soldier set against towering monstrosities, and the only thing which stands between him and becoming giant ant bait is a huge arsenal of deadly toys. Guns, vehicles, lasers, helicopters, even the new jetpacks, the Ravagers will have even more to contend with this time around. Not a shred of the series' character has been sacrificed to fit the modern video game world. It's great to see an online shooter stick to what it does best and not try to sell itself out to get a few more game sales in the process. D3 Publishers tried to slightly mass market appeal their series by giving it a Western developed entry in Earth Defense Force: Insect Armageddon, but it was mostly lost on fans for lacking the same charm only a Japanese budget game can provide. 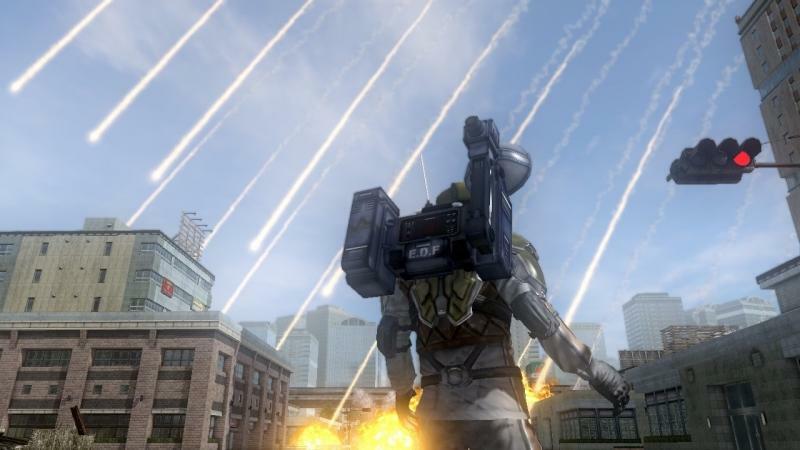 Earth Defense Force 2025 will be released for the PlayStation 3 and Xbox 360 sometime in 2013. It is a direct sequel to the Xbox 360 exclusive Earth Defense Force 2017.